SUMMER NAMM PRESS RELEASE: The popular MINI3 is now available in Classic Vox garb: black vinyl wrap and brown diamond fretcloth. 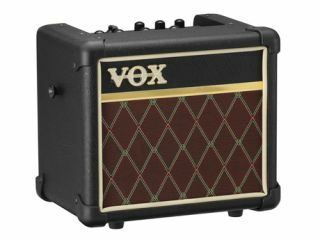 Plug your guitar into the Vox Mini3 and choose from 11 expertly-voiced amp models, from boutique clean to a forceful US high-gain. Now add in some effects. The Mini3 offers your choice of four popular effects, as well as four classic delay/reverbs, plus a built-in tuner. Gain, Tone and Master knobs provide custom control. The Mic input features its own trim knob and delay/reverb send control. Use the aux input to practice playing, or jam to your favourite tunes. The headphone out lets you practice quietly. Use battery power (6 x AA) or the included AC adapter for go-anywhere versatility.